1.- Why am I still playing correspondence Chess since everybody uses programs to find/check his / her moves? 2.- Why do I so much like Nimzowitsch and the Hypermodern period around him (1910-1935)? 3.- Why do I like the Soviet Chess School and the Chess between 1940 and 2000 . 4- Why am I writing this blog? Since writing may constitute a sort of cathartic experience, let’s deal with them. Q1. : The use of strong Chess programs has changed the way CC is played. When you win you are happy, when you lose you wonder what use all this is… I learn the game around 1971 and began to devote nearly all my spare time to Chess in 1978. In the past I did some sport: swimming and cycling. Only swimming remains. So I devote my spare time to reading (10%), other activities (10%) and to Chess (80%). Of course this is an average calculations: while on holidays “other activities” are the 90%! Q2. : This is easy. Freud and Jung would be delighted: my first Chess book was O’ Kelly’s book on Petrosian. The second was Nimzowitsch “Chess Praxis” and the third a small book with all Reti´s compositions. So my “Chess infancy” marked my “Chess adulthood”. Psychoanalysis at its best. Q3. : In 1978 , when I began to seriously study Chess the most important event was the Baguio match between the Anatoly Karpov (USSR) and the Soviet dissident Viktor Korchnoi. The impact on the media was enormous. The Soviet Union had been the driving Chess force since WW2, everybody admired the Soviets, everybody tried to get Russian Chess literature, etc. In 2000 in my opinion the world and the world of Chess were suffering complicated changes.The Soviet Union was slowly disappearing, Karpov one of my all-time idols began to decline. To me it was as if everything had changed forever. Perhaps it was me who changed…In any case, I see it as a turning point in my life. The period 2000-2005 was a terrible personal period for me. I am going to tell you one of my biggest doubts: Period 1930 – 1972. Events: Soviet Union Championships – USA Championships : which of the two were the strongest?????? I guess I will have to devote some more space to this particular question…In a future post. 1. e4 c6 2. d4 d5 3. Nd2 de4 4. Ne4 Nd7 5. Bc4 Ngf6 6. Ng5 e6 7. Qe2 Nb6 8. Bb3 a5 9. a3 a4 10. Ba2 h6 11. N5f3 c5 12. c3 Bd7 13. Ne5 cd4 14. cd4 Be7 15. Ngf3 0-0 16. 0-0 Be8 17. Bd2 Nbd5 18. Rfc1 Qb6 19. Bc4 Bc6 20. Re1 Nc7 21. Nc6 bc6 22. Bf4 Ncd5 23. Be5 Rfd8 24. Rad1 Bd6 25. Rd2 Be5 26. de5 Nd7 27. g3! Nf8 28. Red1 Rd7 29. Qe4 Rb7 30. Rc2 Rab8 31. Rdd2 Ne7 32. Kg2 Qa5 33. h4 Rd7 34. Be2 Rd5 35. Rd4 Rd4 36. Qd4 Nd5? 37.Rc6 Qa8 38. Rc4 Qb7 39. Rc2! Nb6 40. Bb5 Ng6 41. Qd6 Qa8 42. 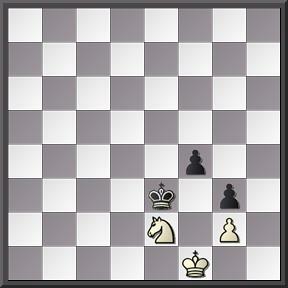 Bc6 , Black resigned.